You want soup? I’ll give you soup! I knew the minute that I began to prep the pumpkins that I would be making soup with some. I knew I wanted it to be sweet and a bit spicy with Thai flavors. What I did not know, was that it would be SO stinkin’ easy! Seriously easy! I think from start to finish was like 20 minutes. My kids thought it was ok… what the hell do they know anyway? They would live on chicken nuggets if I let them! This soup was not quite heavy enough for a main course on it’s own. Possibly with a slice of grilled bread or some sautéed vegetables, it could be a meal. Or… two bowls! Yes, this soup is delicious enough to eat two bowls! Problem solved, dinner served! 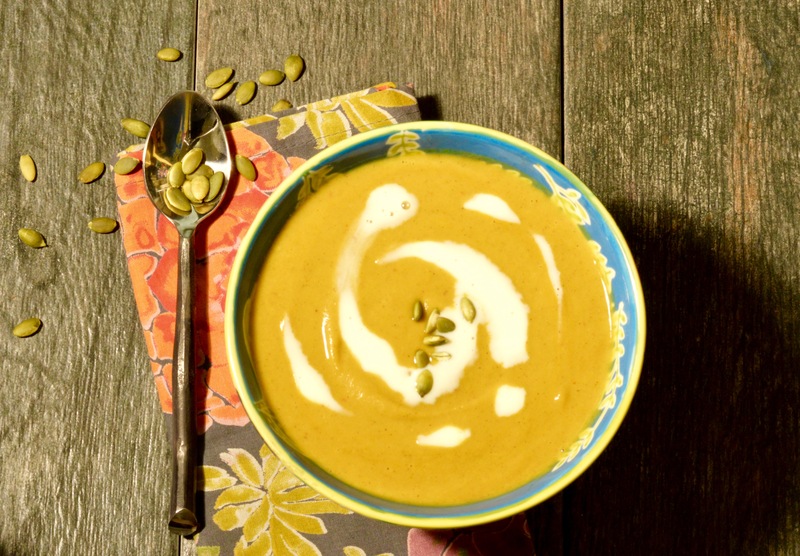 3 cups pumpkin puree, fresh is best and you can make your own by following this recipe. You may use canned but be sure it is not pie filling, because that would taste disgusting. 4-6 Tbsp Thai red curry paste depending how spicy you like. Start with a few and taste as you go. Saute onion in a bit of olive oil in a large pot until it becomes transluscent and soft. Add basil and saute one minute more. Add onion and remaining ingredients to a blender or food processor and pulse until smooth. Taste as you go for seasoning. Return to pot and heat over medium heat until bubbling, stirring often. Serve with a dolop of creme fraiche or sour cream and garnish with a few pepitas. If you can grab some creme fraiche, please do. It’s a richer flavor and goes really well with the pumpkin. Plain Greek yogurt would be a reasonable sub as well. I hope you will try this soup! Even if it’s not “your thing”, step out of your comfort zone and give it a shot. You may surprise yourself and find out you like it! Swearing Mom out.